Knowing the exhibition would be crowded we organised our tickets for the last two hours of the day. Even so the smallness of the rooms and the number of people jammed into them did not make for comfortable viewing. A similar crush occurred during the Da Vinci show. It’s time the National Gallery allocated a bigger space for its major shows. 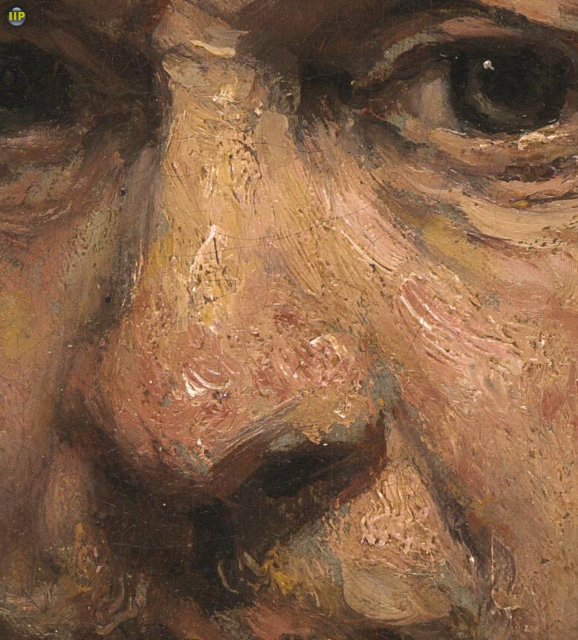 The first room of the exhibition held four self portraits from the last ten years of Rembrandt’s life. Entering from the grey damp London weather directly into the vivid charcoal reds and resinous blacks of the paintings we experienced a quick intake of breath. The powerful self portraits each capture a memento of passing time on his face and form, his flesh more grey, his eyes growing more opaque with the years. Those who know any of the other nearly one hundred self portraits can see his loss of energy, humour and confidence. We believe the paintings to reflect the veracity of his physiognomy and yet we are not looking for attributes that would identify him. We feel he is revealing his inner depth. Knowing that he died bankrupt having turned away from the lucrative commissions which would have kept him in the public eye, suffering the death of lover and children, we feel we are witnessing his sorrowful soul. The exhibition continues with a journey into the oeuvre of the great Rembrandt as he experimented and pushed his technical skill to express his tender view of humanity. The paint itself captured us as it pulsed and swirled, thin as silk one moment and heavy with turbid weight the next. The transparent darks pushed back into unspecified backdrops while the lead white clumped or embroidered the edge of collars or highlights on nose and eyelid. We were particularly taken by these warm and textured whites. They were a character of their own, playing a part as varied and eloquent as a Shakespearian actor. 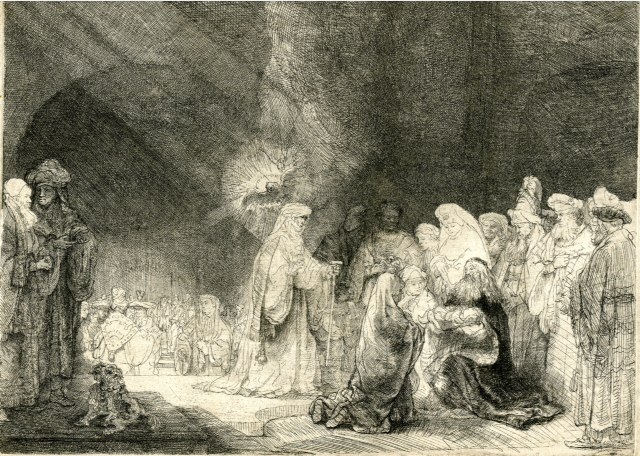 Rembrandt placed the white with palpable energy, using a stick, a brush, perhaps a rag. It hovered under glazes and emerged like waves breaking. His limited palette, with little or no blues and limited earth greens did not keep him from expressing nature while his concentration on capturing faces was best served with the “tetrachromy” of the Ancient Greeks: white, black, yellow and red. A portrait of Lucretia whose blood leaves her white gown stained red, trembles with sadness and dishonour as she plunges the knife into her side. 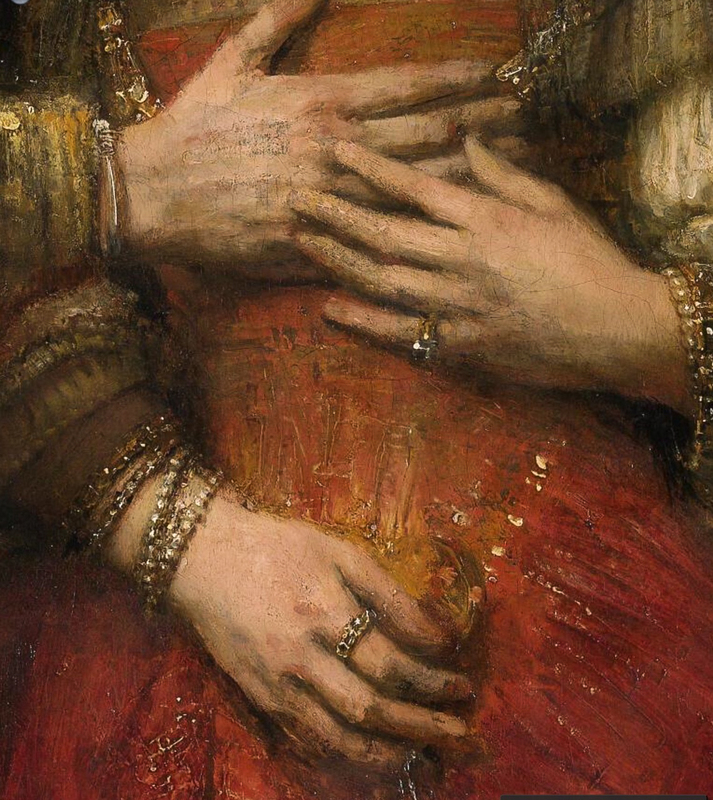 Perhaps it is a tribute to his mistress, Hendrickje, who was hounded by society to confess her sin of living out of wedlock with Rembrandt. The subject from Roman history expresses a woman’s deeply conflicted emotion. The emotion is the theme again with the magnificent painting of Bathsheba as she contemplates the letter from David, her King. The somewhat damaged surface of this work does not distract from the subtle current of anguish she expresses. There are many etchings and drawings interspersed with the paintings in this exhibition. Rembrandt’s etchings are a miraculous tangle of haunting lines. With bravado and verve he depicts so much information with so little effort. These pieces greatly added to our understanding of his vision and method. The vivacious brushwork is equivalent to the handling of the etching needle, the supremacy of white is equal to the vibrant unmarked white of the paper. Light is the subject and everything else falls to its authority. We see his thought process more clearly in the etchings but the large textural paintings dominated the show. This exhibition travels to Amsterdam in February so there will still be an opportunity to see these great and inspiring works. Thank you Jane for sharing your in depth and insightful knowledge of Rembrandt ! You are currently reading Rembrandt. “The Late Works”, an exhibition at the National Gallery in London at The Chronicle.